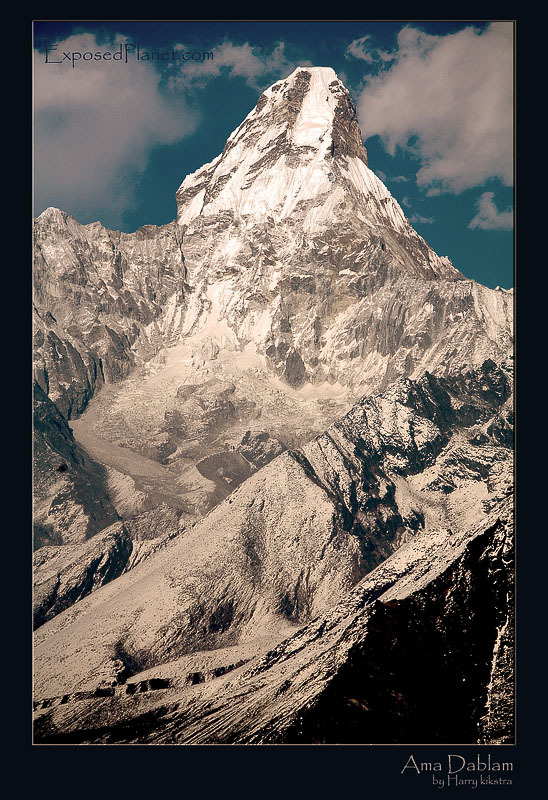 The story behind "Ama Dablam"
There are only 14 mountains higher than 8000m. And more than a hundred higher than 7000m. Sometimes the beauty of mountains lies not in the height, but in more aesthetic qualities. Ama Dablam is ‘only’ 6848m (22467ft) high, but everybody who has seen her, either with their own eyes or indirectly, agrees that this is one of nature’s best works of art. When doing the trekking through the Khumbu Valley towards Everest, you will meet her; every day you will get closer to her majestic flanks until you decide to leave her while going to Everest BC. (See Ama’s page on Summitpost.) Many mountains are holy in Tibet and Nepal and are considered to house many spirits. Before high Himalayan giants are approached for a climb, special ceremonies, called ‘Puja’s’ are being held to please the good gods and to confuse the evil spirits in order to return safely..